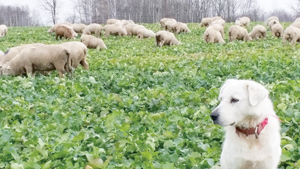 Lambs finished on a brassica mix produced very high omega-3 numbers. Hinckley, Minnesota—While doing research on diet and health, I found an article describing lamb as “land salmon.” The author claimed this title was earned because the omega-6:omega-3 ratio of lamb is closer to salmon than any other domestic meat. Both omega-3 and omega-6 fatty acids are important to our health. But modern diets tend to be too high in the omega-6 fatty acids, which can promote inflammation of tissues and lead to serious health problems. Many nuts, grains and vegetable oils are high in omega-6. At the same time, our diets are commonly low in omega-3 fatty acids, which tend to be anti-inflammatory. The benefits provided by omega-3 fatty acids are thought to be valuable in helping avoid a wide range of diseases, including cancer, asthma, depression, cardiovascular disease, ADHD and auto-immune diseases such as rheumatoid arthritis. Salmon and other “fatty fishes” are known for their high omega-3 content and are promoted as a means of balancing the omega-6:omega-3 ratio in our diets. American diets can be as high as 16:1 omega-6 to omega-3, especially for those who consume lots of fast food prepared with vegetable oils. The preferred ratio in the human diet is thought to be somewhere between 2:1 and 4:1. So why is lamb being called “land salmon?” One answer can be found at http://nutritiondata.self.com/, which provides nutritional labels for a wide variety of foods, including fatty acid analysis. I looked up values for pork, chicken, beef, grassfed beef, domestic lamb, New Zealand lamb, farmed salmon and wild salmon. The table below shows what I found. The table shows that lamb — all lamb — indeed has the healthiest omega-6:3 ratio of all the listed land species. Domestic lamb, which was likely raised on pasture but finished on grain, has a healthier ratio than beef, with significantly higher omega-3 content compared to both conventional and grassfed beef. The New Zealand lamb, which I assume was finished on forages, has less omega-6 fatty acid compared to domestic lamb and a more desirable fatty acid ratio. But none of these meats were really comparable to salmon in total omega-3 content and omega-6:3 ratio. In addition to comparing the various meats, I was curious if lambs finished on a diet of plants selected for their high omega-3 content might have a superior fatty acid profile compared to lambs finished on grass. Research studies have compared the nutrient profiles of lamb finished on a variety of pastures, such as high-altitude pastures with many herbs compared to lowland pastures with more grass. Research has also shown that brassicas provide a very high level of omega-3 compared to other vegetables in the human diet. However, I was unable to find any nutrient research comparing omega-3 levels of lamb finished on brassicas with the meat of those finished on grass or legumes. I wanted to learn more. So I finished my own lambs on a blend of kale, turnips, tillage radish, ryegrass, hairy vetch and red clover. 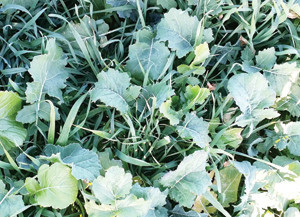 Basically, I added the kale, turnips and clover to a cover crop mix of ryegrass, radish and vetch. I estimate that the ryegrass content of the finishing pasture was no more than 30% of the mix. Lambs spent their final 70 days on brassicas, with the last half of that time on this blend. Lambs were slaughtered straight off the brassica blend without an adjustment period to “deflavor” the meat. Shoulder and sirloin steaks from 10 lambs were sent to Iowa State University for analysis. The results are listed in the “US grassfed” column of the table. As shown, my lamb finished on the brassica/ryegrass mix had much more omega-3 than either the domestic or new Zealand lamb, with a significantly lower omega-6:3 ratio. 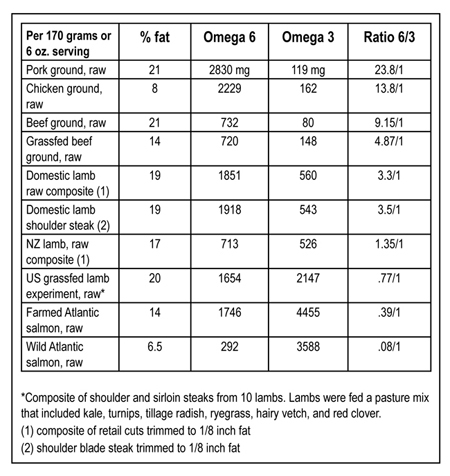 My lamb had lower levels of omega-3 and a higher omega-6:3 ratio than both the farmed and wild salmon. But in contrast to pork, chicken, beef and domestic lamb, my lambs were much closer to the salmon. This is what Janet McNally’s lambs finished on as part of her omega-3 test. One potential problem here is that the meat of ruminants finished on brassicas can carry strong aromas and “off” tastes. The lab noted a strong “herbal” aroma with my lamb. So, in addition to sampling several lambs myself, I asked my customers for feedback. I also sent some brassica-finished samples, along with some lamb finished on hay, to a food writer for her blind evaluation. Of the customers who responded, all were enthusiastic about the flavor and eating qualities of my lamb. I, too, found the flavor to be desirable and, more notably, the lamb was very juicy and tender. The brassica-finished chops sent to the food writer were marked “A,” while those finished for three weeks on hay were marked “B.” She commented that the A chops were “tangier,” while the B chops were sweeter and milder. She preferred the brassica-finished lamb because it had more of a “wild” flavor. The conclusion here is that all lamb should be promoted for its healthier omega-6:3 profile, as it clearly compares very well with the other species. Grass-finished lamb probably does deserve the title “land salmon,” although it is wrong to suggest that it replaces salmon in terms of its fatty acid profile. Finishing on brassicas significantly improved the fatty acid profile and, while still not the same, this lamb was much more comparable to salmon than any other meat. The brassica blend with ryegrass produced a desirable flavor and did not require a period of deflavoring on grass or hay, although lamb finished on straight brassicas might need such a period. This comparison does have some imperfections in that we are comparing meats sampled at different laboratories, possibly with different tests. Yet the results piqued my curiosity, and I plan to test lambs finished with a variety of finishing regimes. For 2016 I will be looking for farms that can finish the same set of lambs by two different methods. It is also important to point out that neither lamb nor salmon can correct a diet exceptionally high in omega-6 fatty acids. If the fatty acid profile of your diet is important to you, it is important to avoid grains and vegetable oils in addition to eating foods high in omega-3.